In a recent post – Cheating Death: The Dark – I discussed the hate-filled path Darth Maul traversed in order to survive his horrific wounding in The Phantom Menace. If you have not read the post, or want to refresh your memory, I would encourage you to do so. In this piece I do a 180, flipping the conversation from cheating death to transcending death in order to consider how a Light Sider user can, if they are chosen and deemed worthy, preserve their conscious identity (and bodily form) in the netherworld of the Force. As I point out in Cheating Death, the Sith and the Jedi share in having dynamic but also limited understandings of the Force. Just as Darth Maul could not dream of the level of Darkness he would reach in his state of intense hatred, the Jedi also lack full comprehension of what the Light Side offers regarding death. This is not a criticism of the Jedi, though. Rather, it is an acknowledgment that the religious orders in Star Wars – Sith, Jedi, Knights of Ren, Nightsisters, and so on – do not have 100% complete conceptual understandings of the Force. Ultimately, the religious orders believe about the Force is centered around their specific experience of it and, as a result, their respective dogmas directly reflect this experiential knowledge. A perfect example of the Jedi Order’s limit is the skepticism – nay, the outright denial – that one can preserve their individuality after death. In The Clone Wars Season Six episode “Voices,” Anakin Skywalker describes the Order’s dogma on the subject of life after death quite poignantly when he states, “…everything that we know about the Force tells us that an individual retaining their identity after death is impossible.” To this we can also add Jedi Master Ki-Adi Mundi, ranking member of the Jedi Council, who notes “…the dead are part of the Cosmic Force and lose their individuality.” Even Master Yoda, the oldest/wisest of the Jedi and head of the Council, does not at first believe in the possibility of maintaining one’s individuality after death, expressing his own skepticism when he hears the voice of dead Jedi Master Qui-Gon Jinn. Nevertheless, Yoda will come to realize that Master Jinn is speaking to him, opening himself to a possibility he thought impossible. In turn, guided by Qui-Gon, Yoda will begin his own journey towards transcendence. The journey, though, is not an easy one. Yoda, we find in the last few episodes of The Clone Wars series (starting with “Voices”), must face significant trials to show that he is worthy of retaining his individuality after death. In other words, the great gift of transcendence is not liberally given to all Light Side users. While Jedi Masters such as Mace Windu, Plo Koon, Shaak Ti, and Ki-Adi Mundi are incredibly wise and act with good intentions, they nevertheless are not presented with the possibility of transcendence. On the other hand, Yoda is chosen to receive the great gift, chosen because he will “teach one who will save the universe from the great imbalance.” Still, even Yoda must be put to the test, and in the episodes “Destiny” and “Sacrifice” he is forced to master himself – his own darkness, hubris, and temptations – in order to prove that he can master transcendence. It is only after passing these difficult tests, coming into a fuller understanding of his own identity and his connection with the Light Side of the Force, that Yoda will begin a long process of training through which he will learn to manifest consciousness after death. Yoda is confronted by his own inner Dark Side and hubris. Although we are given a fleeting glimpse of this training in The Clone Wars, the training Yoda receives has otherwise never been fully explored – either shown nor described – in any Star Wars stories. The same is also true for Obi-Wan Kenobi, whom we also know is granted this gift of transcendence. While Yoda explains, at the end of Revenge of the Sith, that Qui-Gon Jinn will be Kenobi’s guide in the process, we are not privy to the tests or lessons Kenobi will learn from his former Master. Yet, all of this is okay. The Force is mysterious, and some of the sacred teachings, artifacts, and rituals that go hand-in-hand with it should be equally mysterious. Just as Sith and Jedi alike are not privy to every aspect of the Force, the same is also the case for fans of Star Wars. In fact, I would suggest that the training Yoda and Obi-Wan receive never be fully explored, lest we water down the sacred mystery of transcendence through over-explanation or take away from each fan’s imagination. Besides, what we do know is that Yoda and Obi-Wan Kenobi did learn to manifest consciousness after death, proof that their training, whatever it entailed, was successful. But while Yoda and Kenobi completed their mysterious training, we also know that Qui-Gon Jinn did not. In “Voices,” Master Jinn explains that he was killed before his training was complete, before he had fully learned to manifest his individuality after death. While his concious identity was preserved at death, enabling him to speak from the beyond as a manifestation of the Force, Qui-Gon is unable to appear in bodily form to those who are still alive. As we are well aware, appearing in bodily form to the living is something which both Kenobi and Yoda are able to do. This is precisely because their bodies quite literally disappeared when “death” arrived, transported along with their consciousness to the netherworld of the Force. Thus, the pinnacle of one’s training, the pinnacle of transcendance, is the capacity to “exist where there is no future or no past” in both mind and body. Obi-Wan Kenobi’s body disappears as he is struck down by Darth Vader. On this last point, it is worth mentioning that what existence is like for Qui-Gon, Kenobi, and Yoda in the netherworld of the Force is outside of the realm of comprehension. There are simply no words – not here or in any Star Wars story – that can capture what it truly means to exist once one has reached transcendence. Certainly finite language can be used to give hints; after all, even Buddhists understand that all suffering will cease once Nirvana has been reached. But what transcendence actually feels like on a subjective level, what existence means for one who now inhabits the netherworld of the Force, that can only be known to the individual whom has entered the new state of being. And because of this, I hope the existence which Qui-Gon, Kenobi and Yoda achieve is kept a mystery to other characters in the saga as well as fans. When I saw The Phantom Menace for the first time in 1999, I was absolutely stunned when Darth Maul killed Qui-Gon Jinn. At the time, my 14-year-old brain had to cope with the reality that sometimes the “good guys” can be defeated by one of the “bad guys.” Older now, I naturally have a different perspective on the scene and am not quite as shocked by Qui-Gon’s demise. Darth Maul was much younger and more physically gifted than the Jedi Master, and though Qui-Gon was likely more gifted in the use of the Force, Darth Maul was just the better all-around fighter. Or, perhaps it had nothing to do with Darth Maul being the better fighter. Just as Qui-Gon states that finding Anakin Skywalker was “the will of the Force,” I would suggest that the death of Qui-Gon Jinn was also the will of the Force. At first, reluctant to allow Qui-Gon to train Anakin as a Jedi, it is only when the Jedi Master dies that the Jedi Council agrees to let his padawan, Obi-Wan Kenobi, train the young boy. 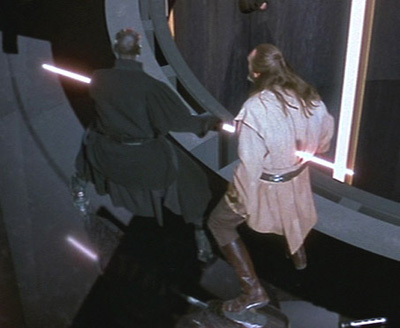 Qui-Gon’s death, then, functions as the catalyst the Force uses to propel Anakin along the path towards balancing the Force. Qui-Gon’s story does not come to an end in The Phantom Menace, though. At the end of Revenge of the Sith, Yoda explains to Obi-Wan that Qui-Gon Jinn has returned from the netherworld of the Force, noting that he will teach Kenobi how to converse with the former Jedi Master. Although the scene is brief, it never-the-less establishes that it is Qui-Gon Jinn, teaching from the beyond, who directed Kenobi in unlocking the secrets of existence after death. When Obi-Wan “disappears” in A New Hope, and reappears as a Force ghost in The Empire Strikes Back and Return of the Jedi, we now know that it was Qui-Gon Jinn who guided Kenobi in discovering how to do these incredible things. Further, it is in Season 6 of The Clone Wars, in the episode titled “Voices,” that Qui-Gon reaches out to Master Yoda as an incorporeal voice, instructing the Jedi to travel to the planet Dagobah. There, Qui-Gon will reveal new realities about the Force, and will explain that both he and Yoda had been chosen to maintain their life force after death so that in the dark times ahead, there would still be light. Though Qui-Gon notes that he died before completing his training, which hinders him from appearing to Yoda, he reveals that Yoda will learn this ability as he continues on his journey of discovery. Along with what Qui-Gon explains to Yoda about the Force, another rather intriguing point is also introduced in “Voices.” When Yoda explains to the Jedi Council that Qui-Gon has conversed with him from the beyond, Master Ki-Adi Mundi states that, “What Yoda claims is not possible…the dead are part of the Cosmic Force and lose their individuality.” Even Yoda, the wisest and oldest of the Jedi, does not at first believe in the possibility of maintaining one’s individuality after death. Knowledgeable about the Force they might be, but even the Jedi Council is limited in their understanding of the mystical power. This fact, though, also reveals something about Qui-Gon Jinn: before he died, he had ascertained a unique understanding of the Force – an understanding that fundamentally differed from the Jedi Council’s own knowledge – and had kept this knowledge to himself. 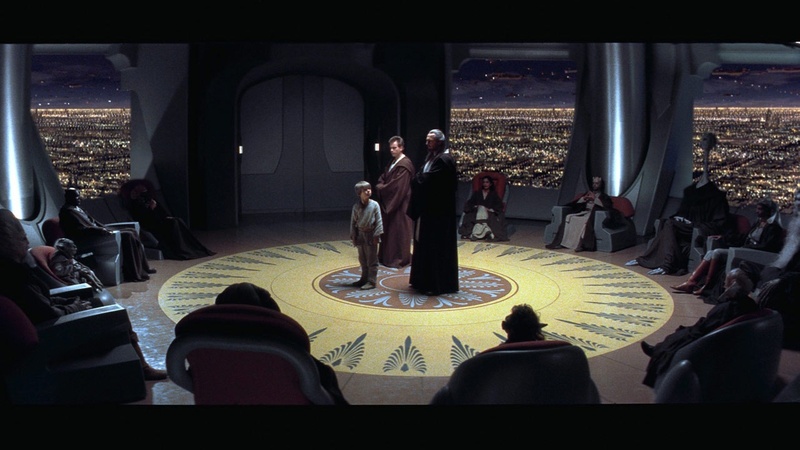 In The Phantom Menace, the Jedi Council and Qui-Gon Jinn are clearly at odds, particularly over the fate of Anakin Skywalker. While Qui-Gon is certain the boy is the Chosen One, the Council is not as certain. The Council believes the boy is too old to be trained; Qui-Gon does not believe this should disqualify him from being trained. Qui-Gon chooses to take Anakin as his padawan, but the Council states that the Jedi Code forbids his taking a second padawan. Qui-Gon states that Obi-Wan is ready to face the Trials and become a Jedi Knight, the Council rebukes him by stating that they will decide when Obi-Wan is ready. Four points of contention in only a minute. These may not be enough to argue that Qui-Gon is always at odds with the Council, but the interaction between Qui-Gon and Obi-Wan only moments later can do it for me. Obi-Wan: Do not defy the council, Master, not again. Qui-Gon Jinn: I shall do what I must, Obi-Wan. From this small exchange, we can glean that Master Qui-Gon has a tendency of refusing to follow the Council’s directive. His padawan implores him not to defy the Council once again, but Qui-Gon will do what HE feels he must do. I don’t know about you, but this leaves me wondering not only how, and how often, he has defied the Council in the past, but WHY he has done so. Was it in his nature to be defiant? Did he learn it from someone? Or was it perhaps a little bit of both? Whatever the case, there is a very obvious way he would have learned some of this defiance: from his own former Master, Count Dooku. It is in Attack of the Clones where we learn Qui-Gon Jinn was once Count Dooku’s padawan. Given that Count Dooku left the Jedi Order after becoming cynical and disillusioned by it, and because he craved more power, it is hardly a stretch to imagine that Dooku held these feelings for quite some time, perhaps even while he was training his young padawan. As Qui-Gon’s master, Dooku would have exerted an incredible influence over his padawan, impacting the way the burgeoning Jedi would have understood the Force, the Jedi Order, and the role of the Jedi, amongst other things. The fact that Qui-Gon Jinn learned how to preserve his individuality after death probably did not come from Count Dooku directly, but his interest in discovering new realities about the Force would have certainly been planted by his Masters encouragement to question the Order’s views. It is also likely, though, that as Qui-Gon grew and formed his own, independent views, that he would have most certainly questioned his Master. Defiant he might have been towards the Jedi Council at times, Qui-Gon Jinn never left the Order, and his former Master did. With all of this in mind, I am going to propose a novel idea. No, seriously, I am going to propose an actual idea for a novel. My proposition is that a novel dedicated to Qui-Gon Jinn’s back-story be added to the Star Wars canon. With all that we know about Jinn, that he was apprenticed to Count Dooku, was defiant of the Jedi Council, believed that Anakin was the Chosen One, and was able to preserve his life force after death, I am curious to find out even more about this fascinating Jedi. What was he like as a child? What was his relationship really like with Dooku? Did he ever challenge his Master? What were his beliefs regarding the will of the Force? When did he begin training to preserve his life force after death? How and why did he consistently defy the Council? When was Obi-Wan apprenticed to him and, for that matter, what was Obi-Wan like as a child? Such a book could certainly answer some of these questions about Qui-Gon, and could also be used to develop other characters, story-lines, events, and ideas. Plus, as it currently stands, a dark area exists in the Star Wars canon prior to The Phantom Menace, with only small pockets of information that provide clarity for this period. A novel dedicated to Qui-Gon Jinn would be a great way to start filling in the gaps in the timeline, and would help paint a small picture of what the galaxy was like prior to the crisis on Naboo. It is my hope that someday we are able to explore the Star Wars universe through the life of this fascinating Jedi Master. In the meantime, I decided to play around with what the prologue for said novel could look like. Master Yoda stood in the center of the icy Temple, watching the seven younglings walk towards him. Shivering and exhausted, the children looked up and around as they entered, awe struck by beauty of the icy hall. Behind them, the outside wind could be heard far down the passage, blowing through the entrance they came through. The younglings had traveled for miles across the wintry landscape since landing in the Crucible, the Jedi training cruiser. They did not yet know why they were on the planet Ilum, only knowing that the ice-covered and wind-battered planet was one of the Order’s most sacred locations. “Where are we, Master Yoda,” a female Chagrian asked the elder Master as the group approached. “Come, gather round younglings. Share with you, I will, why you have come,” Yoda responded. Moving into a half-circle around the old Jedi, the younglings watched as Master Yoda used the Force to manipulate an object on the ceiling. Reflecting a sliver of sunlight streaming in from an opening in the top of the hall, the object reflected the light onto the wall of ice behind Master Yoda. On command, the ice melted away revealing a passage way, and beyond, a cave. This time, a young Zabrak male spoke up. “Master, what are Kyber Crystals,” the child asked. The younglings, hearing that they would enter the cave to discover the most important component in the construction of their light-sabers began to talk excitedly. Finding their crystal would put them one step closer to becoming full-fledged Jedi. Letting out a small laugh, Yoda silenced the group. Looking upwards, the younglings saw that the tall entrance was already beginning to freeze as the light from outside slowly moved downwards. Eager to discover their crystals and not wanting to be trapped inside, the younglings frantically rushed past Yoda and into the cave to begin their searches. All, that is, except for one. A young human boy around the age of 10 stood in place, continuing to look at the ice that was slowly creeping downward from the ceiling and which, in a few short hours, would cover the entrance. Turning, the Jedi Master saw that the child had not left his spot. “And what have you to say about the ice, hmmmm,” the Yoda asked. “That if it is the will of the Force for me to be trapped, then it is the will of the Force,” Qui-Gon responded looking back at the Jedi Master. Walking past Yoda, Qui-Gon ascended the few stairs to the caves entrance. Stopping at the opening, he gazed into the darkness beyond, feeling the Master’s eyes fixated on him as he stood there. Turning his head and body half-way around, the child let out a small laugh. Turning, the boy ran into the darkness of the cave.